Shaun Connor and Sophie Renouf in action on Brisbane’s Waterloo Bay this week. Pittwater Youth Sailors from the Palm Beach Sailing Club and Royal Prince Alfred Yacht Club have been working hard this past year to qualify for the 2015 Australian Sailing Youth Team and four of our local athletes, the team of Shaun Connor and Sophie Renouf, as well as the team of Kurt Hansen and Jim Colley, have done exceptionally well and will be nominated to the Yachting Australia Board for final selection to contest the 45th ISAF Youth Sailing World Championship in Malaysia in December. "After teaming up with Sophie in September 2014, our goal was to qualify for the ISAF Youth Worlds in Malaysia. After competing in this event last year I wanted to go again as it is such a high caliber, there is no other regatta like it, the best of the best. We have come a long way since then, training 2 to 3 times a week and competing in all possible regattas on the east coast of Australia, " Shaun Connor said. "Our training now steps up to sailing a boat with a spinnaker, and developing new skill set for this as we will be racing a SL16 in preparation of the Youth Worlds in December." "Which we are both really excited to participate in." Sophie added. The competition for the much coveted selection points was tight and Brisbane’s Waterloo Bay offered conditions similar to those expected in Malaysia to make up to ten races across the fleets. “It’s great to have won Queensland Youth Week and making the team for my third time. Malaysia should be quite light so I’ll have to work on my fitness a bit, but I’m really looking forward to it as it’s another chance to prove myself. The last couple of years didn’t go too well for me, so this year I’ll be pushing extra hard as it’s my last Youth year. I want to get a good result and will work hard to get there”, he said at the conclusion of the regatta. 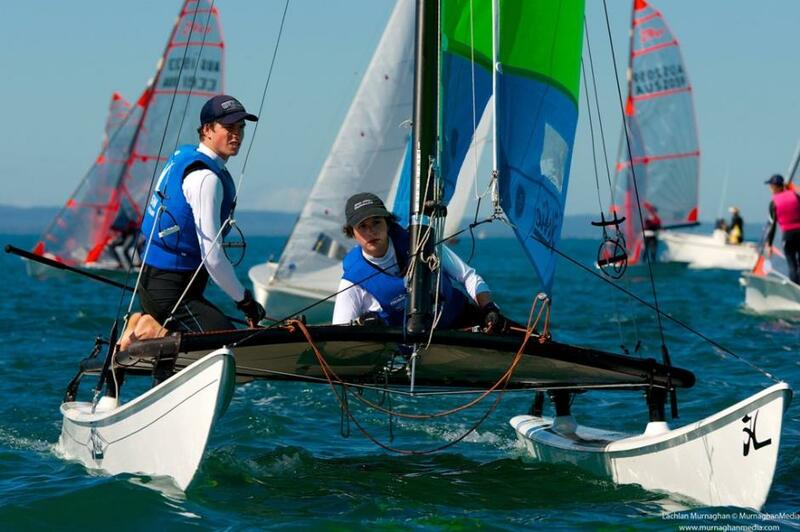 2015 Australian Youth Champions from New South Wales Alec Brodie and Xavier Winston Smith had another excellent regatta in Queensland and came out on top of the selection series and thus winning the Youth Team spot. On the nomination point score they were only one point ahead of James Grogan and Nicholas Sharman from Victoria going into the final selection event, but managed to lock it all in on the final day of the regatta. We had a couple of nerve-wrecking races but we managed to get the job done in the last race, we did what we had to do and are pretty happy. We beat the others to the Youth spot and we’ll be off to Malaysia at the end of the year. It’s exciting and we’ll have to start training for that now,” said Xavier Winston-Smith. The pair had continuously moved up the ranks and finished the regatta as the top female boat and in a strong second overall in the mixed-fleet behind regatta winners Laura and Hayden Harding (VIC). “Coming overall second was really good for us, but most importantly we beat all the girls teams, meaning we qualified for the Youth Worlds, which we are very happy about. I like sailing against the boys and that’s what is great about sailing. You get to race the boys as well as the different age groups at other events. This was a light wind regatta and it’s just better to be a girl in light wind,”Nia Jerwood laughed. 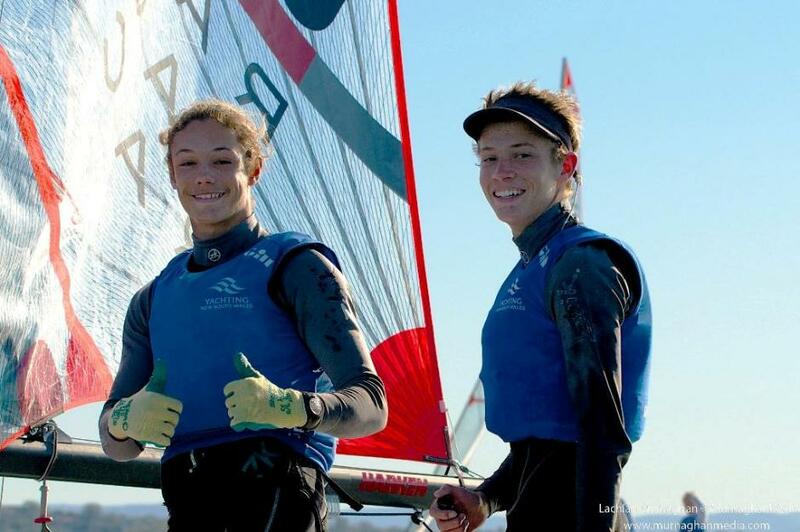 “This will be our second time at the ISAF Youth Worlds. We came ninth in Portugal last year, which was really good, but we want to improve on that and hopefully we’ll do better this year. Going into the final selection event New South Welshmen Kurt Hansen and Jim Colley and Queenslanders Kyle O’Connell with Tom Siganto were tied on points after O’Connell and Siganto had won the 2015 Australian Youth Championships, while Hansen and Colley had won the 29er class nationals. Kurt Hansen is the 2014 29er Open World Champion and has formed a successful partnership with new crew, 2014 Australian Sailing Youth Team skipper Jim Colley. The pair had one of the tightest battles at the Youth Champs in January with O’Connell/Siganto coming out on top, but from the start of racing in Queensland Kurt Hansen and Jim Colley made it clear they wanted the Youth Team spot and posted a series of convincing results. They won five and finished second in four of the eleven races, securing them the Queensland Youth Week win as well as the Youth Team spot. “We’re pretty stoked to win this regatta and the Youth Team spot. Of course there was a little bit of that extra selection pressure, but our goal here was to get top threes and apart from one race we managed to do that and slowly managed to get a bit of a lead in the regatta,” Jim Colley said. “It’s great the girls from New South Wales are going to Malaysia as well. We’ve been training with them for the past year or so and it will be great to head over there together,” Kurt Hansen said. “We’re pretty excited. We’ll be the first all girl team to race at the Youth Worlds, which will be great. Our goal was to go out there and beat everyone and that’s always our goal. And we want to do the same at the Youth Worlds,” Amelia Stabback said about the goals ahead. “We are all training partners and that really helps. Kurt and Jim are really good, which gives us a good goal to aspire to and to train against, so that’s really helpful, good for starting practice and all that. “This will be my second ISAF Youth Worlds and I hope to better my position from last year. Laser year in Portugal I finished fifth and hopefully this year I can sail for gold,” he said. “I have a great team behind me and I reckon top five at the ISAF Youth Worlds should be doable. It’s great to train with the best in Western Australia. If you train with the best you will improve with them as well and it’s been a phenomenal aspect of my development and I couldn’t be more grateful,” she added about the strong training environment in WA.